There’s darkness in the City of Light. The Fibonacci family saved Mercy Watts’ life and now she owes them a favour. Calpurnia Fibonacci calls on Mercy to make good. When you’re dealing with a powerful mafia family, refusing isn’t an option. So Mercy travels to Paris, home of the Louvre, catacombs, and secrets, to search for the identity of a woman glimpsed for just a moment on the fashionable Rue Cler and some answers to a few family mysteries of her own. To make matters worse, Chuck and Aaron tag along and they have agendas of their own. With the Mafia and the shadowy Klinefeld Group involved, finding the wife of Riley will be much more dangerous than she ever expected. Another thrilling and humorous adventure in the Mercy Watts mystery series. 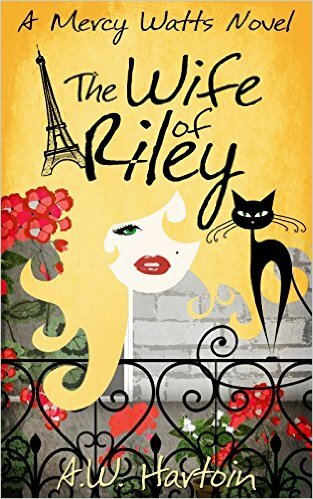 The Wife of Riley is book 6 in the series and for me it is a five star read. I love the quirky characters, the mystery is always intriguing and well thought out. I love how active and capable Mercy is. She can certainly defend herself and others when the occasion arises. There is a sub-plot that runs through the series involving Mercy's godmothers and their WWII art collection. We are also teased with Mercy and Chuck's relationship which I am loving. It keeps me coming back for more. Aaron is another very quirky and lovable character who really comes into his element in Paris and we learn more about him. The trio's adventure really made me nostalgic for the city. If I had just discovered this series with book 6 I don't think I would have enjoyed it as much without already knowing the characters well from the previous books. So I would recommend anyone who is thinking of reading the series please start at book one. That way you won't miss any of the fun and you will fall love with the characters just as I have.